Two of Vancouver’s newest city-shapers shared their experiences from one of North America’s most vibrant cities – Chicago – last night at SFU. Vancouver Deputy City Manager Sahdu Johnston and TransLink Vice-President of Planning Mike Shiffer both worked in the Windy City, one in the Mayor’s office, the other in the Chicago Transit Authority, at a time when sustainability was emerging as a key platform in the city’s political culture. Their talk was co-sponsored by Planning Institute of British Columbia — South Coast Chapter, Metro Vancouver RAIC Chapter, and SFU City Program. Chicago had “skytrain” [the elevated railway] and trolleybuses and had aspirations for BRT in the 1950s. Chicago built the El 100 years ago and that was one of the main issues – how to maintain and upgrade aged infrastructure. But they also had the opportunity to shape communities: there was an extensive streetcar system which produced the land use pattern familiar here based on a rectilinear grid of streetcar lines. The City also experienced change to its urban form as the Dan Ryan expressway penetrated close to downtown. That replaced the dense tenements with housing projects but those also now gone . He showed how transit was shoehorned into the highway median, “not the most pleasant environment to wait for a train”. The high-rise offices also now dominate downtown – “there are no mountain views to block there”. The El also shaped the city as former industrial neighbourhoods of the inner city became residential areas but also serves the lower density outer suburbs, with very varied results. He then showed some of the academic work he had conducted at MIT including a riverfront collaborative planning system for St Louis, which essentially combined maps and pictures, as well as Multimedia Visualisation for the FHWA, FTA and US DoT web based multimedia and a visualisation of noise impacts which brought him to Chicago. He became CTA VP Planning and said that the CTA was a “challenged agency” facing capacity needs and aging infrastructure funding problems. It serves the central part of the metropolitan area: there is also a larger regional agency which is much bigger than Metro Vancouver. He showed how similar statistics for bus and rail for the two agencies look, but what that confuses is that Translink’s 2m population is spread over the whole region, whereas the CTA serves a larger population at the centre of a much bigger area. He did this by relying on a spatial data structure – he used census and other population and employment statistics together with data from faregates and smart cards to understand travel patterns. As well as gates on the rail system they had gps on the buses plus automatic passenger counters. In addition they did outreach through surveys and workshops. This lead to improved routes for buses and some strategic plans, although he conceded there is now “not much room to implement them”. He also showed how sections of the El were reconstructed over a weekend. This method replaced the earlier practice of closing lines – sometimes for years at a time – which lost ridership. He was also responsible for setting up an academic partnership which produced over 80 theses on topics of interest to the CTA. he started by talking of his commitment to cities and environmental issues and spoke of his early experience “saving Cleveland” mainly by building communities after his earliest experience of how his neighbours helped each other. 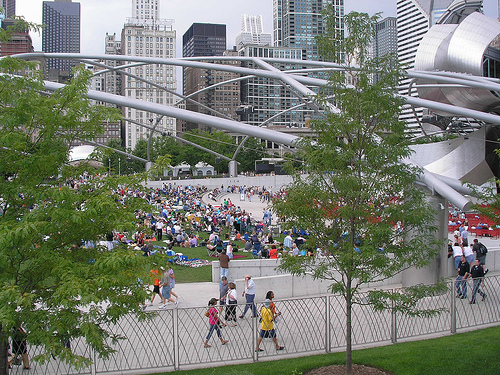 Chicago has preserved its lakefront and early on the commitment to the greening of Chicago was made before he arrived. For instance the City introduced planted medians instead of traffic lanes [actually reducing vehicle capacity!] and over 500,000 trees were planted. They have also made a huge effort to introduce green roofs – 7m sf – more than the rest of the US combined! He showed a picture of the city centre’s Millennium Park which was built as part of the City’s environmental action agenda leading by example. The issue of Climate Change has also received a lot of attention. The projected number 100 degree days the city experiences in a year – mainly die to the urban heat island effect could be 31 days (compared to just 2 in 1961-90) or perhaps could become 8 days if they can lower emissions. There is a similar forecast for days of extreme precipitation and also a huge increase projected for cooling degree days (i.e. the amount of air conditioning needed). This he stressed was adapting to climate change not mitigating it. The City discovered that its climate zone changed between 1990 and 2006, meaning that the types of trees and plants it uses has had to change. There are five strategies but one common feature is to understand the co-benefits of action. For example the green roof on city hall had a sigificant effect on energy use and thus on its operational cost. One year the City had to cancel its annual Marathon after one death due to the extreme heat. They looked at the route as an area to increase available shade from new tree planting. From that developed a city wide tree canopy strategy which has had to aggressive to deal with heat island problem. The process of adaptation to climate change caused them to re-examine the Role of Cities. He demonstrated that while emissions from cities appear much greater than the surrounding area its emissions per capita are far lower than the suburbs. There would be significant savings in energy use if suburbanites lived like city dwellers. Interestingly transportation accounts for only 27% of city emissions. The city now has many LEED certified new buildings and has started on the massive task of retrofitting existing buildings by tackling the two biggest – the Merchandise Mart and Sears Tower. In both cases the savings in energy costs make the retrofits financially attractive. They have also noticed that geographically foreclosures on residences are concentrated in areas where energy spending is highest. They see the retrofit program as a source of green jobs. Since he has only been in Vancouver for two months he did not say a lot about programs here but noted that Vancouver has lowest ghg per capita in North America (4.6 metric tonnes CO2 equiv). Vancouver is on track to reducing greenhouse gas GHG emissions by 6% below 1990 levels by 2012 (setting a target for Vancouver comparable to what the Kyoto target is for Canada) despite a population increase of 27% and jobs increase of 18%. The aggressive goals set by the Green City Action Team show that the city is “poised to lead”. Unlike Chicago, 37% of ghg emissions come from transport, but the city is also tackling ghg from buildings, including the use of district energy systems. 1 What plans are there to use existing railways for passenger service? 2 [addressed to Sahdu Johnston] You spoke of an interdisciplinary way of working. Is there a process of cross departmental working in Chicago? MS – Through the use of smart card technologies we will get more efficient use of the network. For example by offering a bonus for off peak travel or charging fare by distance. There are similar technologies for vehicles to enable TDM measures. The role of technology is to provide incentives for some routes and times and thus produce a more balanced system. 5 How does Transit Oriented Development (TOD) provide affordable housing? MS – We need a mix of land uses to support transit. There have to be destinations on various parts of the line, not all centralised in one spot. We also serve different activities over time (there are different demands at night than during the day). For transit the key for all levels of activity to increase. If we are to connect to low income housing ( in the US we are required to look at an environmental justice review) we need to do spatial analysis. The guiding principles for providing service [outlined above] provide a lot of opportunity. 6 – What do you see as greatest challenge here? 7 Does the push for electric vehicles and other small, fuel efficient cars subvert transit? don’t have to drive every day. 8 It now seems we have two agencies doing regional planning. Is there competition between them? I had been looking forward to the evening. I think I would have preferred a format that promoted discussion and debate rather than two powerpoints and some Q&A. The audience seemed distanced and not engaged, and the presentations were both based on what seemed much used material “what I did in Chicago” not “what we could do in Vancouver”. Mike Shiffer had a great deal of material on his slides which he had to hurry through – hopefully the slides will be on line somewhere. Sahdu Johnston tried harder to get people engaged, but with scant response from a large room. Shiffer’s geeky approach is a huge change for planning at Translink. He showed one slide which illustrated bus stops which have the most pass ups. I really want to know what the data source for that was. In the bad old days, the bus operators refused to collect any data at all. I suppose someone at CMBC is logging pass ups that are radioed in onto a geocoded database. I do know that there are not many buses here with GPS and apcs so I do not think he can yet have the data richness he enjoyed at the CTA. He did have some google map images which showed ridership by route – but it looked to me like it was just the 99 and former 98 B lines – but it went by too fast (a familiar story for Vancouver bus users). If someone at Translink is reading this, please tell us how you are tackling the long standing dearth of good quality data at Translink. Because if that does not happen then the technology is useless – garbage in, garbage out. I think he muffed the answer to TOD and affordability – and it is the same for energy use. Households that do not need to spend as much money on fuel and equipment for heating and driving can better afford the mortgage. It is the same Location Efficient (and Energy Efficient) Mortgage story we have heard many times. Shiffer spoke about what TOD does to reduce transit costs – which is a whole different matter. He was also wrong, I think, to suggest that shape and serve can happen at the same time. That has not worked here. We have spent so much on serving existing demand (mostly in the City of Vancouver) there was nothing left to shape growth, which as a result is car oriented and has abysmal transit service. If the Broadway Corridor moves up the priority list (as his stop motion video of B Lines loading at Broadway and Commercial will support) this pattern will continue. But chicken/egg – you can find prominent voices agruing against building transit to shape growth and prioritizing exisitng corridors. * poor ridership resulted in an opportunity cost. Lots more riders could have been taken up by a line that went where people lived. So instead we build multi-billion dollar highway projects in those areas and ensure they remain car dependent for the forseeable future. I was talking about building the M-line WRT serving existing centres or to shape future development. I wasn’t talking about highways. If anything, I’d rather we use gateway money to start Evergreen and Broadway rapid transit, establish b-line service in Surrey and to start RT corridor planning in surrey/langley. what has been spend to serve existing demand in the city of Vancouver beside some new trolley? Voony. Take a look at the map. Most of the rapid transit in this region radiates out from downtown Vancouver – even though the commute pattern has not been centered there for many years. And you may not have noticed but the majority of the latest expansion of the system is in Vancouver – its called the Canada Line and has been extensively discussed here. Meanwhile in the area south of the Fraser – where most of the new population will be accommodated – nothing. But they do get a lot more freeway. Chalk up the “need” to serve existing demand to our society’s (or Vancouver’s) distrust of government. The population won’t allow the government to plan what’s best for them – so the govermnment needs to demonstrate – on an objective basis (i.e. economically) – that the new rapid transit line is “worth it” (the dreaded “business case”). Add that elected officials cannot be seen as wasting taxpayers money with a folley that doesn’t pay immediate dividends (Olympic Village comes to mind) – politicians will be kicked out of office on a whim. I think Ron C. is saying that people on the whole tend to be short-sighted. a ‘business case’ can be used to provide more objectivity, but of course that is in the eye of the beholder. And of course the orneriness and short-sightedness of people when you want pain now with planned gain later. If you build with a relatively low cost technology you can afford to both shape and serve, but it will always be an uphill battle against car-oriented planning. I think if we put transit where people are today and run it in multiple directions it will continue to serve well into the future when travel patterns have changed. The problem we’ve had for the last few decades is seeing each new transit service as a feeder to the existing network, essentially forcing people to make transfers and use services they shouldn’t need to. Evergreen, if built, will look increasingly foolish in the future as travel shifts from Vancouver to Surrey. Such passengers would need to ride 3 different SkyTrain lines to reach Surrey. LRT over the new Port Mann bridge connecting Surrey to Coquitlam, PoCo and Port Moody is the forward thinking option that was ignored in the desire to feed more people onto the existing SkyTrain lines. Let’s hope it’s still technically possible to either change the plan before the bridge is built or at least make it relatively simple to install rail in the future. It’s an opportunity that arises once every 75-100 years and it would be a crime to blow it. Burnaby offers great examples of where we’ve gotten it right and where it’s gone horribly wrong. The rejuvenation of old town centres and conversion of empty spaces like Gilmour may count on the plus side, but there are plenty of issues on the other side. A prime example caused by the choice of SkyTrain are the big holes on the Expo and M lines. The space between Royal Oak and Edmonds is filling with medium density auto-oriented development because there’s no station to permit anything transit oriented. Between Rupert and Gilmore nothing much is happening yet, but I can see the writing on the wall. Farther south in Big Bend there’s a huge new shopping complex. It’s highway oriented planning at its very worst, an isolated outpost on the edge of a city where virtually nobody can get if they don’t drive. We don’t have a decent transit system because BC politicians at all levels still have that used cars salesmen outlook of the Socreds of old and, when travelling outside BC, have likely seldom used rapid transit (remember Falcon discovering turnstiles in London? obviously he wasn’t familiar with Toronto). Many cities around the world–some bigger, other smaller than Vancouver–have long had a rapid transit system that serves all the areas of these towns (including Toronto and Montreal) yet their politicians aren’t incredibly smarter than ours. They do have a broader knowledge of the world AND rely on transit experts.. It is also true that far too many average people in Vancouver don’t know and care about rapid transit. For them it is another socialist institution. Even though the first transit systems were built by conservative governments.. But if you use portland’s example, they built 4 LRT lines and a streetcar. Some studies would suggest there is little mode shift from the car for commuters in spite of that. Calgary has shown greater mode shift in the past 10 yars. Is that due to their LRT? Land use patterns that encourage a dense downtown area that is central to the metro area? the high cost of all-day parking? or a combination of all three? and is that sufficient to have a vibrant neighbourhood? And why is calgary’s average commuting time in 10 years longer by 14 minutes and vancouver has stayed the same? “Burnaby offers great examples of where we’ve gotten it right and where it’s gone horribly wrong. A prime example caused by the choice of SkyTrain are the big holes on the Expo and M lines. Remeber those are municipal planning desicions. Big Bend could have remainded industrial, but it didn’t. Burnaby did score successes that you didn’t mention; I am unsure why you do not count City in the Park and townhouse developement by Edmonds, and the moving of burnaby south high school from kingsway to royal oak as new skytrain-orientted development, but they are there. The remaining land is light industrial. Did you want to remove more industrial-zoned area from a transit-rich zone? I am unsure why you think putting LRT everywhere will be a solution. What do i think? -LRT is not a panacea, just as skytrain is not a panacea. -a good transit system needs to be multimodal and have stable funding support. -planning and land use is also important, as is the law of unintended consequences. But Vancouver has been growing to – up 6.2% between 1996 and 2006 according to the census. Look at not only all the green towers that have gone up near BC Place (I remember when that was a rail yard with no streets) but also in South Granville. The real question is: why are developments allowed to proceed in the far reaches of Surrey when rural land is within a 15 minute bus rider of new rapid transit stations in Richmond? Wouldn’t Westminster Hwy between No 4 and No 5 Rd be a great place to develop a more transit/bike/pedestrian environment? Although I don’t wish to get too involved in the debate here, it seems to me that BC politicians, often born and breed of the lucrative Vancouver property industry, see transit projects not as solutions to transportation problems or tools to achieve certain outcomes but as political accomplishments. Another trophy to add to their metaphorical political cabinets and talk about in their memoirs. The more unnecessary bells and whistles, like grade separation and driver-less operation, the greater the accomplishment. So I think this political and social structure which rewards the builders, no matter what they build or how they get it done, is a major hurdle which is holding back Metro Vancouver from achieving its potential. You can talk light rail vs SkyTrain all you like but until the rules of the game are changed, Vancouver residents will continue to be short-changed with sub-optimal solutions like the Canada Line. But land use and transit go hand-in-hand. Transit spurs development pressure with any mode, like tram-train. Well, that’s a trueism, transit or non-transit. WRT property development and politics, what do you make of woodwards? or Surrey City Centre/SFU Surrey? I’m not sure that there is such a thing as a centre of the commuting pattern in this multi-nodal region. Commutes are largely focused on our regional centres, and transit lines have mainly been built to connect regional centres. What would rapid transit look like south of the Fraser? Should there be lines that radiate from its largest centre, Surrey Central, to its secondary centres, Guildford, Newton, Langley City? Should there be a line on the Southern railway corridor to Scott Road, even though it does not go through the largest centre? Should there be few or many stations on this line, reflecting a more regional role akin to Chicago’s Metra or a more local role akin to the El? I’m not saying that I think that is happening is right or good – I’m just providing a reason why I think it is happening. And my comment was more on the elected politician versus planner (i.e. city/metro planning staff = government, too) theme. I wasn’t referencing corporate interests at all. @Stephen, You seems to consider that the Canada line is “serving existing demand (mostly in the City of Vancouver)” leaving “nothing left to shape growth”. This is rather a moot viewpoint. You say that “the commute pattern has not been centered [on Vancouver] for many years” Though the commute pattern become more complex , seeing the current commuting pattern on road as well as on transit, you will admit this view can be called to question. that is also the point I was trying to make in my recent post: http://voony.wordpress.com/2010/01/25/what-if/ where you can see the effect of a network with regional line disconnected, because shine to go into the city core. Surely it is not just in Vancouver that commuting patterns have changed through the years. No every worker in …enter here the name of many biggish cities that you know well (not including Vancouver)…commute now (by rapid transit, cars whatever) via the old historical downtown that used to be the major traffic hub. One major flaw we have here is that developers (condos, offices, malls etc.) work on a project in near total isolation and secrecy. Without any input at first from the city and others. There is no “Grand Plan” for the whole town/region. Or so it appears. Indeed the non-profit company I was working for had already purchased a lot, hired architects, designed a building, got financing and even got a preliminary OK from the city, before other departments at City Hall and neighbouring businesses knew what was planned and of course raised the– not too surprising– NIMBY stink. By contrast on other continents there is a 2000 years(or more) tradition of towns being planned whole (either from scratch or as a major urban renovation of an older one) by a King or local lord in the old days and now by Regional and National governments. Paris’ 19th century drastic makeover is well known but there are numerous other examples, both much older and newer. These urban makeover did then, and still do now, leave lots of room for private developers but within roads, transit networks and other services and amenities, that are planned for the good of the whole city. Then there are the carrots and sticks approach to “convince” Joe Public. Like roads congestion charges on one hand, more transit on the other. @mezzanine – what I’m saying is that the projects they push through aren’t geared towards cost-effectiveness or measurable outcomes. They are geared towards impressing power-brokers within their own party. Why else would Falcon have pushed through Gateway, despite all the evidence that it will not achieve its intended outcomes? To impress the right people in the Liberal Party. So what I’m saying is that the people who rise to the top of the major parties in BC are those who push through projects against mounting evidence that there are better, more cost-effective solutions. It is the political process which delivers the real-world outcomes which is flawed. Too much special-interest influence I guess you would call it. BTW – I think Woodwards and Surrey Central are both excellent but they aren’t massive money spinners for developers like Canada Line and Gateway. Treading very carefully in a murky debate, to be successful, public transit must serve the publics need. It must take the customer from where he/she lives to where he/she wants to go as easy and transfer free as possible. Every independent transportation consultant I have talked have been amazed that we are still fiddling around with SkyTrain and that we are not designing our urban transit to serve the customer’s needs. The customer is paramount in good transit planning. The Canada line is a good example of poor transit planning, as it is 1) far too expensive to expand and 2) forced people to transfer from bus to metro, especially those who once had a transfer-free journey to Vancouver by bus. Building with SkyTrain or metro and light rail, certain important considerations must be made; 1) volume of customers to be served, 2) destinations to be served, 3) ease of integration with other transit systems and finally 4) the cost of building and operations. We can’t ‘spend’ our way out of our transit debacle, but we must start to plan wisely and for the future. The SkyTrain versus LRT debate puzzles just about everyone outside the lower-mainland, yet it is preference for expensive metro by politicians that has created a financial minefield for TransLink and a disjointed and user unfriendly transit system. Unless one lives near a direct transit line and ones destination is along the direct transit line, taking the car will be easier and faster. Continuing to build with metro on routes that do not have the ridership to sustain them, will do little in attracting new ridership but will further burden TransLink with a heavier subsidy load. The taxpayers pockets are getting rather threadbare. Canada Line a failure? Id say it is, it’s too small and needed to be built to a bigger spec. …and started carrying that in Mid January 2010. Will we build evergreen/broadway to the proper spec? I would say that the Canada Line, with so much of its length within the City of Vancouver, is putting more pressure on the City of Vancouver to densify outside the downtown core. If the City of Vancouver fails to densify around Canada Line stations in any meaningful way, it’ll really show what/who drives development at the city. Good luck ever getting sufficient funding when all that’s built is light metro at 4-6 times the cost of LRT. It’s shocking how our supposedly business educated provincial government can’t grasp the concept of bang for the buck. Canada Line will put pressure on to densify and there are plans to redevelop Oakridge Mall into a huge mixed use complex with residential and commercial towers. TransLink has similar plans for the old transit yard just west of the mall. Where some densification has already taken place, from 14th to 17th, there’s no station. That’s mainly because of financial pressure. Too many underground stations would have pushed the original estimate high enough that the local politicians who were goaded into voting for it would never have acquiesced. It would have also increased travel time and thus failed to meet the ridiculous requirement from the federal government that travel time from YVR to downtown must be 24 minutes or less. I certainly won’t say Canada Line is a failure, but it cost far too much. One day it will be seen as an impediment to getting better transit in Richmond because it’s simply too expensive to extend all the way to Steveston and Ironwood where it ultimately needs to go. He is right of course but in real life it is a pipe dream that only happen for the happy few. Even in metropoles with over 10 millions inhabitants (Tokyo, London, Paris..) where there are enough customers to justify a very dense network of metro/ buses /commuter trains lines, one still often has to transfer a couple of times. the thick red line is the new tram. I just can’t understand the aversion that people here have about transferring a couple of times. I have done it routinely in Toronto, where I lived for many years, I do it here in Vancouver, I do it when travelling in foreign countries and don’t even think about it. After all even a car doesn’t take you straight from the middle of your living room to your office desk or to a supermarket grocery aisle. You have to “transfer” 2 or 3 times (from your home to your car, from the parking lot to the elevator then to your office or to a store)and these transfers are as long or longer than going from a bus to a metro or LRT. Whether it is a Metro, a LRT, an automated LRT (SkyTrain), a bus, a commuter train, anywhere in the world one has to transfer to another line and/ or another mode of transportation. Only in Vancouver do I hear and read that it is such a problem for so many??? What concerns and bothers me a lot more than a few transfers is the appalling fact that the whole Westside of Vancouver, from Oak to UBC, along with the whole North shore, still don’t have rapid transit in 2010, in one of the “most liveable town in the world”. Compare our transit map to those of Toronto and Montreal, both towns with too small a rapid transit for their size..and yet..
the subways are the yellow, green and purple thick lines..the blue line is the ALRT. It is well known that TransLink all but invents ridership numbers. To start, ridership is automatically inflated by about 30% because TransLink claims that each Canada Line car has a capacity of 200 persons which is based on all seats occupied and standees @ 6 persons per metre/2, yet industry standard is all seats occupied and standees at 4 persons per metre/2. So for all practical purposes the capacity of the ROTEM cars is about 155 persons not 200. BC Transit & TransLink tried the same game years ago with both the SkyTrain Mk.1 and 2 cars! A casual glance at the operating schedule plus calculating the real car capacity gives a figure around 80,000 a day, which is about the same number of people who previously used buses on the same route and now are forced to ride the Canada Line. Unlike Calgary Transit, which actually counts boardings at stations three times a year, TransLink relies on an alchemist’s secret formula based on….???? ?…..TransLink never says. Only if simple turnstiles were placed at stations to count boardings, just like SeaBus, would we have accurate ridership numbers; which seems TransLink did not want, even though the project was a P-3 and financial penalties were to be paid if ridership did not match projections. The Canada Line is the Premier’s baby and it will be made to look successful, but until the metro carries over about 400,000 customers a day (that figure from UBC Prof. Condon) it will be a financial millstone around TransLink’s (read the taxpayer’s) neck. According to zweisystem of Rail for the Valley, who appears to be no fan of the Canada Line, your last post is totally off base. “As RAV/Canada Line has no turnstiles and relies on laser counters that lose reliability in congested locations, ridership on the RAV/Canada Line nay[sic] be distorted by as much as 15%.”, not the 30% you claim in the post above. zweisystem does not state that this is 15% greater so does this mean that ridership could be as much as 15% greater than TL states. We both agree translink is broke. From the above, you would think that if we built LRT, translink would have no funding problems. I would think translink is broke because of governance issues and a lack of adequate funding from the local and provincial levels. Even if the canada line and all future projects were LRT, I think we would still hae problems. Remember the Comptroller general’s report…. So even if Canada Line was LRT, an expanded bus system in lower density areas and a hesitant provincial governement would still mean funding shortfalls. That’s not to say that isn’t a bad thing. We are building rideship and changing culture in the valley. And we maintained our bus service even as places like Portland (of all places) cut bus service. But it makes you wonder how we will be able to implement rapid transit in the valley (or broadway) in the most appropriate way. Reading thru the comptroller general’s report again, now that we are approaching 2025 ridership quickly, does that mean the C-line is approaching breaking even with operations? Of ridership, turnstiles and fare evasion. As Stephen and I have pointed out numerous times, TransLink really hasn’t a clue as to how many people ride the metro system. Their claims of ever higher ridership do not mesh with revenue collection. Ron Stromberg (a transit specialist who worked on the original SkyTrain and other metro projects abroad) has pointed out that many times that revenue apportioned to SkyTrain doesn’t match claimed ridership, which for many people, assumes that there is massive fare evasion on the metro system. More probably the ‘SkyTrain’ revenue is indicative of real, lower ridership numbers. As there is no independent audit of ridership, TransLink can claim any number they wish without fear of contradiction. Some years ago I inquired of Calgary transit how they counted ridership and the answer was quite candid. They had staff at each station counting boardings for the entire day, thus over a period of a week, got very accurate numbers. They counted boardings three times a year. Funny, I understood entirely how Calgary transit counted ridership on the C-Train. When I told the same official how Calgary did it, he retorted, “we do not have the employees available to attempt such a proposition. Some 15 years later, TransLink still does not divulge how they count ridership. As for Canada line revenue, a source has told me that a lot of students with U-Passes are using the line, if this is true, depending on the number of times they ride the transit system each day, the Canada Lines portion is anywhere from $0.44 cents or less, which is hardly the revenue stream that would fund a metro. If and when turnstiles and fare cards are in use, I believe there will be much embarrassment and shock and disbelief with the provincial treasury, TransLink and the taxpayer. Ron Stromberg? That is so 1995…. (bi-directional APCs are in all canada line stations. My guess is that translink bypassed APCs for the E and M lines as they are going straight to faregates). Could it be the same professor whose seems to claim you can get a LRT system in the middle of Broadway for less than $16million/km (see http://voony.wordpress.com/2009/10/05/a-streetcar-named-16-million-desire/) ? @ Voony. Indeed LRT can be built for $16 million/km., in Helsinki new tram lines have been built for about $5 million/km. including the overhead, but not including cars. LRT can be built quite cheaply if one does away with major engineering. As for metro needing ridership of 400,000 passengers a day or more, Condon is conservative in his estimate. @ mezzanine. Yet you don’t divulge just how they come up with ridership figures on SkyTrain. You cloud the issue with APC’s which, as you state, not fitted on SkyTrain! The APC do not work well in the small and crowded Canada Line stations and their information is highly suspect, but TransLink will crow of ever higher imaginary figures, if it suits their purpose. This reminds me of the final days of Expo, where BC Transit claimed ever higher ridership on the wee metro. By the end, SkyTrain was supposedly carrying close to 400,000 passengers a day. The problem was, it ran at 5 minute headways back then and the best it could carry in ‘crush’ was 200,000 a day. It was a decade later that BC Transit all but admitted that their ridership counts included the Canada Pavilion SkyTrain shuttle and that the Mk. 1 car ‘crush’ capacity was gauged at about 125 persons! TransLink was basing their ridership counts on 4 car Mk.1 SkyTrain at 500 persons – 200 more than can be carried today! It is behind that back ground of mind numbing propaganda that I do not trust TransLink and treat their statistical analysis as pure invention. Fact is, most transit officials I have corresponded with outside of BC, share the same opinion. I dislike hijacking this thread, but contrary to what you think, malcolm, a lot of translink workers go at great length to provide information on skytrain ridership. A partial methodolgy is found in the 2007 fare evasion report. a full methodolgy can probably be found by a polite question to jhenifer at the buzzer blog and a better understanding of statistics that I have. Fare audits are done 3 times per year that combine passenger ridership sampling, fare evasion sampling and analysis of type of fare payment (passes, faresavers, etc). this is done at all skytrain and seabus stations, major bus depots and randomly selected bus routes. This statistical approach is comparable to 24 hour all-passenger counting. So they do a little more than ‘make up ridership numbers’ and collect more levels of data in the process. A former TransLink employee who performed passenger counts was told to count every “full” Mk. I car as 100 passengers. I, on the other hand, have made it a habit to actually count my fellow passengers on rush hour trains. My last count of a Mark I car had 17 standees in one end and 7 in the middle section between the doors. I was unable to get an accurate count at the far end, but 17 would be a fair estimate based on equal levels of crowding. That’s 41 standees. Add the 36 seats and you’ve got a total of 77 passengers. I think you’ll all agree that counting 77 people as 100 is exaggerating things more than a little bit. Hopefully TransLink has stopped that particular practice, but I wouldn’t put money on it. You both are confusing capacity with ridership. Capacity is typically passengers per hour per direction and is a measure of how many people can travel past a certain point. Ridership is the number of people who board the system in a given period of time. As most passengers do not travel the whole line, the boardings can be greater than the capacity at a point in the line as when one passenger leaves the train, that leaves capacity for another passenger to board. The ridership is determined by counting or estimating the number of people boarding at each station then adding the station counts to get the total boardings. The employee you mention David, was not counting the ridership, but the load on the line at a given point, which is useful to determine if more capacity is needed on the line. This would not be used in estimating ridership so your point about only 77 passengers being on the train as opposed to 100 is not relevant in a discussing on reported ridership. but then, may you explain why it cost more just to replace some ties and rail and add a bit of gravel in Vancouver on an already existing railtrack? Also, if LRT are so cheap in Helsinki and you need 400000 rider to justify subway, why they are extending their subway, carrying barely 200000pax, this in a city, roughly the population of Vancouver but twice less dense? could it be because the operating cost of their streetcar is 6 times more the one of their subway (source http://en.wikipedia.org/wiki/Helsinki_Metro)? It seems they are also transforming their subway to driverless operation by 2013 (still wikipedia): Could it be the result of the Translink propaganda? Your count is more accurate and realistic. Translink states on official literature that the Mark 1’s capacity is 80 pax per car. WRT your anecdote, do you have any more details? what year was this employee working? were they doing station counts any differently? Did the employee try to raise this issue with his management? If they did, did they provide sufficent explanation? take his/her input thoughfully? or give them the brush-off? I was talking about observed vehicle utilization, how full or empty trains appear to be as they pass a particular point on the line. Such “counts” should be performed regularly because it’s vital to know if certain portions of the line are experiencing capacity problems even if the rest of the line is not. It is unfortunate if anyone believed that counting point utilization is the same as counting actual boardings. I never intended any confusion. The point was simply that assigning a value of 100 to a car with a realistic capacity of 80 is suspicious. Thanks for that link. I haven’t got time to read it all right now, but I did get a good chuckle from the claim that automated operation prevents trains from bunching. Now we know TransLink staff don’t actually use their own transit system.